This memoir of 24-year-old Philani Dladla will be one of the most inspiring, young South African stories you’re ever likely to encounter. An avid reader with an insatiable desire for knowledge, Philani has used his love for books to overcome drug addiction and change his lot in life – while trying to do the same for others. Philani’s story is one of triumph and redemption that will touch the hearts of all who read it.It was through the bag of books that he had managed to keep from his inherited collection that Philani would start turning his life around. Philani started reviewing them and selling them to motorists. He demanded a price according to how he rated the work in question. His unique approach soon became known as “the pavement bookworm”. 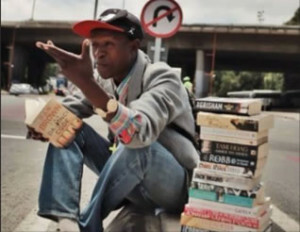 A documentary filmmaker Tebogo Malope, interviewed him about his roadside bookstall and posted the video online where it went viral. And his life changed.